As a walking enthusiast, I’ve discovered that I’m nearly as invisible to the average driver as a motorcycle so I’ve learned to exercise extreme caution when crossing streets. And driveways. And parking lots. And, well, the sidewalk, too, for that matter. Bicyclists still ride on sidewalks in this part of the country and I’ve even seen a car or two drive over the curb, onto the grass, over the sidewalk and lodge in a tree or storefront. But I’ve been lucky these past twenty years. Notwithstanding today’s close call, I haven’t been run down or run off the pavement. So imagine my surprise as I set out this frosty morning and heard a little voice in my head urging me to look over my right shoulder. Not ten feet away from me was the hood of an expensive foreign SUV, barreling through the intersection at high speed. I had only a moment to register my bearings before sprinting to the curb, but in that moment I learned a lot. The driver, a woman with children on board, sat behind the wheel with her teeth bared in a snarl. I could hear the muffled epithets directed at me through the windshield. (Yes, I was that close). She neither slowed nor honked the horn, but proceeded with her turn without concern for my safety. 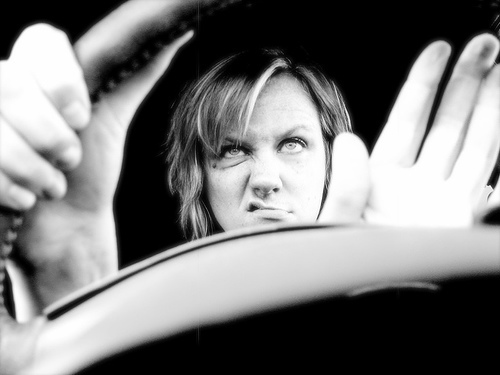 When I reached the curb, she continued her diatribe… this time she rolled down her windows to make certain I heard her remarks, which were both loud and obscene. I wondered if she had ever read the Rules of the Road… or if she cared whether her small charges in the backseat were learning new vocabulary. After the adrenalin subsided and reflection began, I thought about my narrow escape. If she had hit me, would she feel remorse or justification? It’s unlikely that person capable of such as she had done would be given to regret. Would she respond to punishment? Unlikely again. And although nothing would have given me more pleasure in that moment than to see her arraigned for manslaughter, I had no wish to sacrifice myself or anyone else for that end. And so the maniac driver remains at large, threatening pedestrians in her assault vehicle whilst retaining the image of caring parent. Sound like anyone you know?